The following are the combined requirements to fully complete all difficulty levels for this set of Tasks. Individual requirements to complete all Tasks for a specific difficulty level are listed under the corresponding Task section. 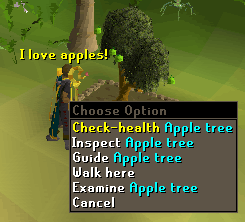 Speak to Jackie the Fruit at the entrance of the Brimhaven Agility Arena. To access the Task list, click on the the list of quests and click the green icon circled below in green. 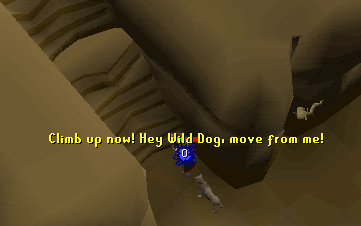 You can not just go to Karamja and start doing the tasks. You need to speak with Jackie in the Agility Arena and she is the start point. Once you speak with her, the 'Karamja' in your diary will turn yellow and you can start completing tasks. Once you have completed a task it will be crossed off. When you have finished a section the words Easy, Medium or Hard turn green on the guide scroll. You can finish all parts of the diary in no particular order. The rewards, however, do have to be collected in order. For example, you can't claim the reward for the hard tasks when you haven't finished the medium tasks. Jackie is located in the hut where the Agility Course entrance is. For a better location see Brimhaven Agility Arena. Jungle Foresters are located along the entrance to the Khazari Jungle. They will help with the Tasks. Owner of the hotel in Shilo Village, he helps out people by telling them about the Tasks. 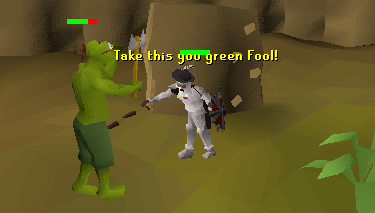 His hotel is located just north of the slayer masters hut (up the ladder). 1. Pick 5 bananas from the plantation located east of the volcano. 2. 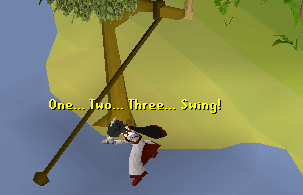 Use rope swing to travel to the small island of the east coast of Karamja, where the Moss giants are - Use the rope swing to the west of Brimhaven. 3. Mine some gold from the rocks on the north-west peninsula of Karamja - The gold is located slightly north west of the rope swing. The gold is in a horse shoe shape. 4. 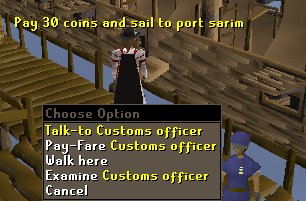 Travel to Port Sarim via the dock at Musa point -Travel to Port Sarim, paying or using the Ring of Charos (u) works. 5. 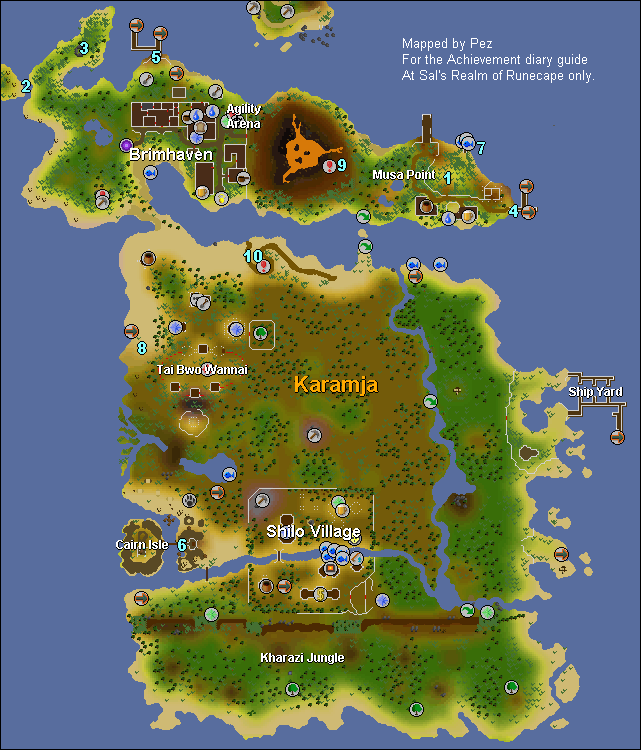 Travel to Ardougne via the point near Brimhaven -Travel to Ardougne, paying or using the Ring of Charos (u) works. 6. 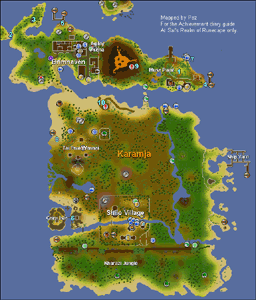 Explore Cairn Island to the west of Karamja - Cairn Island is to the west of Shilo village and south of the hunting spot. Climb the rockslide and walk across the bridge to complete this task. Beware you may fall off and could take around 11 hits of damage. 7. Use the fishing spots north of the banana plantation - Fish either swordfish or lobster in the fishing spots just above the banana plantation. You can also use bait and net fishing as well, as long as you catch a fish. 8. 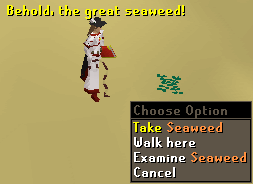 Collect 5 seaweed anywhere on Karamja - seaweed on Karamja is located along any coast. Dropping and picking a single seaweed up also works. 9. 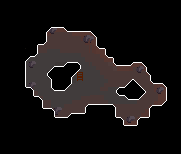 Attempt the TzHaar fight pits or fight cave - Attempt either mini game, you may walk in the fight cave then exit straight away. 10. Kill a Jogre in the Pothole dungeon - Kill a Jogre in the Pothole dungeon west of the Harpie bug swarm. See the Jogre hunting guide. After completing all the easy tasks you have the chance to visit Jackie the Fruit and get rewarded: A pair of Karamja Gloves 1 and an Ancient lamp giving 1,000 experience in a skill of your choice. 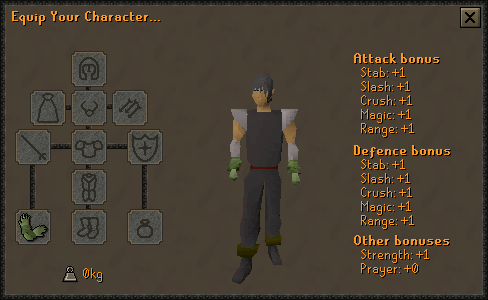 When examined they say "a pair of pale green Karamja gloves." When worn, they lower shop and boat prices on Karamja. Boat prices are cut in half, and shop prices are decreased by about 14% to 17%. They also increase the amount of money given when selling an item to a shop. The gloves do affect the price of items sold to the general store. 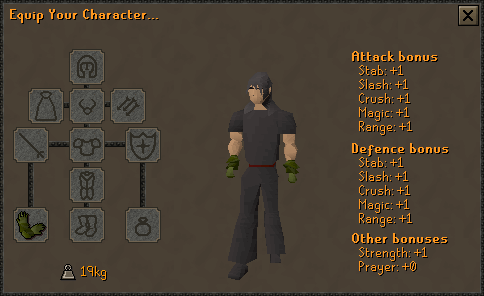 For example when buying flax from the general store in Musa point, without the gloves it would cost the usual 5gp, with the gloves they would cost 4gp. Devon's Amulet Store In Brimhaven. The Shrimp and Parrot In Brimhaven. Obli's General Store In Shilo village. Fernahei's Fishing Shop In Shilo village. Slayer Equipment In Shilo village. 1. Claim a ticket from the Agility Arena in Brimhaven - See Brimhaven Agility Arena. 2. Discover hidden wall in the dungeon below the volcano - Need to have completed Dragon Slayer. The wall is near the red spider egg respawn. On the other side of the wall there are lesser demons. Push wall to gain access. 3. Visit the isle of Crandor via the dungeon below the volcano - Need to have completed Dragon Slayer. Climb up the rope at the far end of the passage (past Elvarg). You only need to step on Crandor then you may climb back down. 4. Use Vigroy and Hajedy's cart service - Shilo Village needs to be completed. 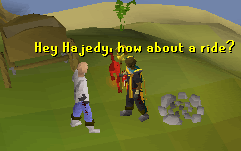 Hajedy is in Brimhaven next to the farming patch, Vigroy is in Shilo Village. 5. Earn 100% favour in the village of Tai Bwo Wannai - Need to have completed Tai Bwo Wannai Trio. Hack at jungle to gain favor. Also see Tai Bwo Wannai Clean up. 6.Cook a spider on a stick - Obtain some Skewer Sticks by using a Machete with a Jungle Spar from the Tai Bwo Wannai Cleanup game, then kill a Jungle Spider and take its carcass and use it the stick and cook over a fire. Note: You can use arrow shafts instead of skewers). 16 cooking needed. See the Cooking guide on how to make them. 7. Charter the Lady of the Waves from Cairn Isle to Port Khazard - Go to Port Khazard via the ship just south of Cairn isle. 8. Cut a log from a teak tree - 35 Woodcutting needed. 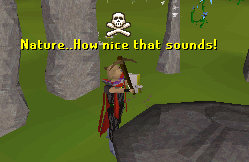 Cutting logs anywhere other than Karamja won't work. 9. Cut a log from a mahogany tree - 50 Woodcutting needed. 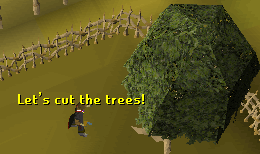 Cutting logs anywhere other than Karamja won't work. 10. 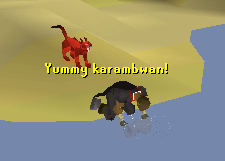 Catch a Karambwan - 65 fishing needed. 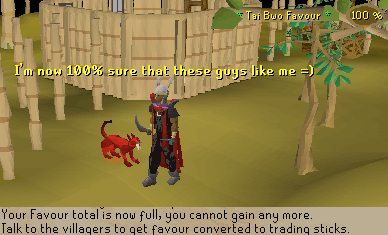 Tai Bwo Wannai Trio needs to be completed. 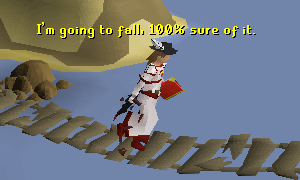 If you have finished the quest you need to fish for them east of the Tai bwo wannai across the log balance and north of the crashed gnome glider. 11. Exchange gems for a machete you need to have Tai Bwo Wannai Trio quest completed. To trade gems for a machete you will need at least 300 Trading sticks 3 Opals and 1 Gout tuber with Safta Doc. See Tai Bwo Wannai Clean up. 12. Grow a healthy fruit tree in the patch near Brimhaven - At least 27 farming needed. 13. 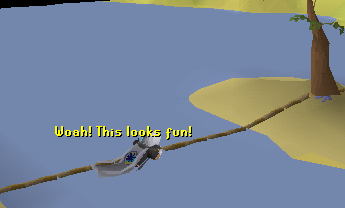 Use the Gnome Glider to get to Karamja. -Grand tree quest needs to be completed. Choose "Gandius"
14. Trap a Horned Graahk - 41 hunter needed. They are located just above Cairn Isle which is west of Shilo Village. See the Hunter guide. 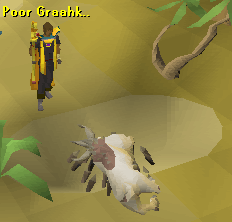 Choosing fairy ring code "CKR" will land you near the Graahk habitat. 15. Chop vines to gain deeper access to the Brimhaven Dungeon. 16. Cross lava using stepping stones within the Brimhaven Dungeon. 17. Climb stairs within the Brimhaven Dungeon. 18. Charter a ship from the shipyard in the far east of Karamja.- The shipyard is located just north of the working gnome glider. 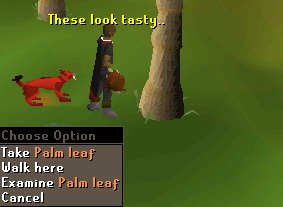 See the Monkey Madness guide. 19. Mine a red topaz from a gem rock. -Shilo Village needs to be completed. The rocks are in the north east corner of the village.40 mining needed. See Mining for picture and other information. Do the tasks in this way: 2, 3, 1, 4, 13, 10, 15, 16, 17, 5, 8, 9, 11, 14, 7, then enter the Shilo Village for 19, then back to the center of Karamja and do 18, 12, 6. Do the tasks in this way: 13, 1, 2, 3, 4, 19, 7, 14, 11, 8, 9, 5, 15, 16, 17, 10 , 18, 12. Do the tasks in this way: 19, 4, 13, 1, 2, 3, then back to Brimhaven for 10, 15, 16, 17, 5, 8, 9, 11, 14, 7, 10, 18, 12. After completing all the medium tasks you have the chance to visit the Hotel Manager and get rewarded: A pair of Karamja Gloves 2 and an Ancient lamp giving 5,000 experience in a skill of your choice. 1. 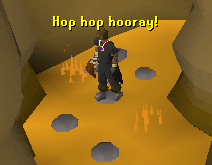 Become Champion of the TzHaar Fight Pits. 2. 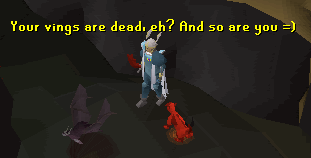 Successfully kill a Ket-zek in the Fight Caves - See TzHaar Fight Caves. This NPC is level 360 and you meet it for the first time at the 31st wave. 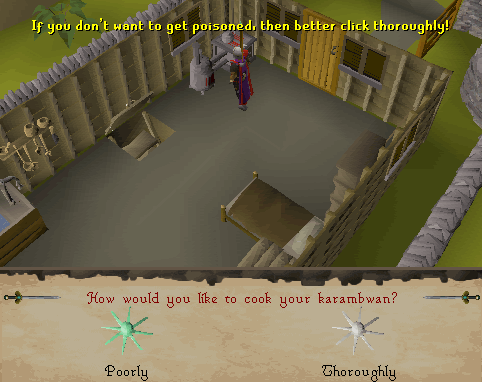 5.Cook a Karambwan thoroughly - There is a special way to cook Karambwan; please see out Cooking guide for details. 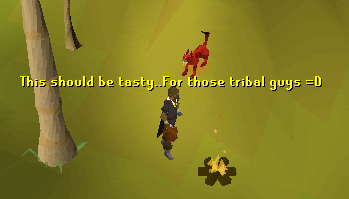 Tiadache will teach you how to cook a Karambwan thoroughly. 6. Kill a Deathwing in the dungeon under the Khazari Jungle - Death wings are level 83, they are bat-like and only drop bat bones. See Legends' Quest on how to get to the dungeon. 7. Use the crossbow short cut south of the volcano - 53 Agility,42 Range and 21 Strength needed as well as a Grappling hook. The short cut is below the volcano. See Musa Point. 8. Collect 5 palm leaves - Shake palm trees to get leaves. You may drop and pick up the same leaf 5 times. 9. 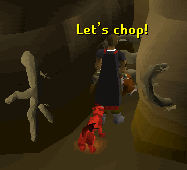 Be assigned a slayer task by Duradel north of Shilo village - See Slayer guide. 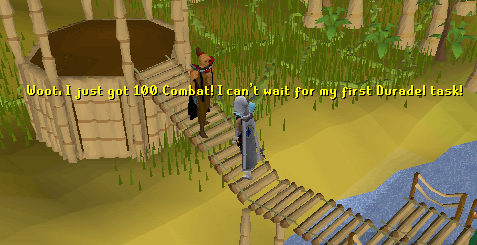 To be assigned by Duradel the Slayer Master, you'll need 100 combat and 50 slayer. 10. Kill a metal dragon in brimhaven dungeon - See the Brimhaven Dungeon guide. 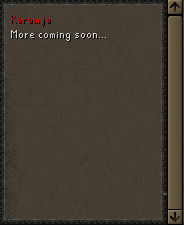 There are three possible metal dragons: Bronze (level-139), Iron (level-189) and Steel (level-246) (Mithril dragons are not on Karamja so they wont contribute to the diary). They aren't hard if you have a combat level higher than 80, an anti dragon shield (which is a must!) and prayer. Visit the Metal Dragon Hunting guide for more info. Do the tasks in this way: 1, 2, 7, 7 (get back with the grapple), 5 (can be done at any Range), 10, 4, 8, 6, 3, 9. Do the tasks in this way: 10, 5 (can be done at any Range), 1, 2, 7, 4, 8, 6, 3, 9. Do the tasks in this way: 9, 8, 6, 3, 4, 7, 1, 2, 5, 10. After completing all the hard tasks you have the chance to visit Jackie the Fruit and get rewarded: A pair of Karamja Gloves 3 and an Ancient lamp giving 10,000 experience in a skill of your choice. You can operate the Level 3 gloves to teleport you directly into the mine. Climb the ladder and you end up near the gem rocks. You need to be wielding the gloves to enter the mine from above.